“You say you want a revolution,” go the Beatles lyrics. Well, yes, I do—and I know you do too. With craft beer sales nipping at the heels of wine sales, and the full-flavored beer movement capturing palates across the land, we are in the midst of a boom. Yet, in terms of pairing and beer’s placement on the menu, many retailers still cast wine as their leading star. Dear Restaurateurs: It’s time to have your menu present beer in the same manner as food and wine. We know that beer sales are the strongest over both wine and spirits. 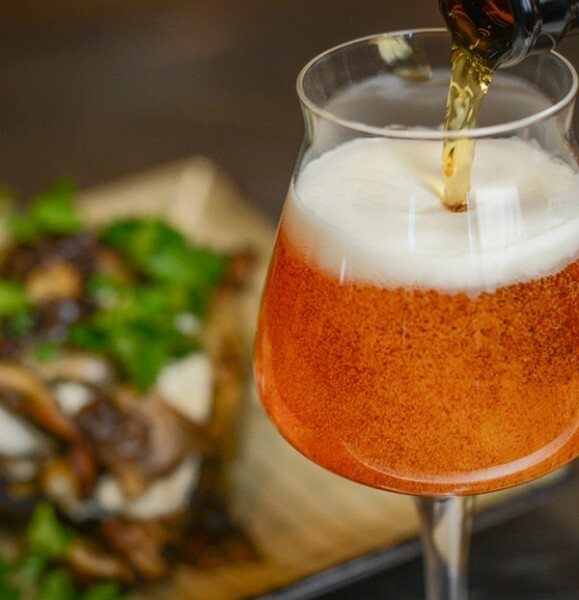 We know that beer is a fantastically powerful ally in the kitchen, next to the plate and on the palate. And when it comes to what customers want, now we have data that is too powerful to ignore. In 2015, a Brewers Association-commissioned Nielsen survey focused on on-premise choices found that an overwhelming majority of customers who order beer are thinking about how it will pair with their food. 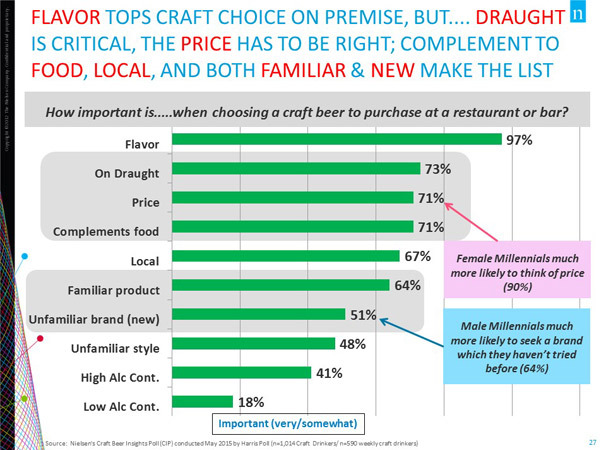 71 percent of craft beer purchasers gave “complements my meal” as a very or somewhat important selection criteria in their beer choice when at a bar or restaurant. Wow! And looking at the slide below, that number is increasing. 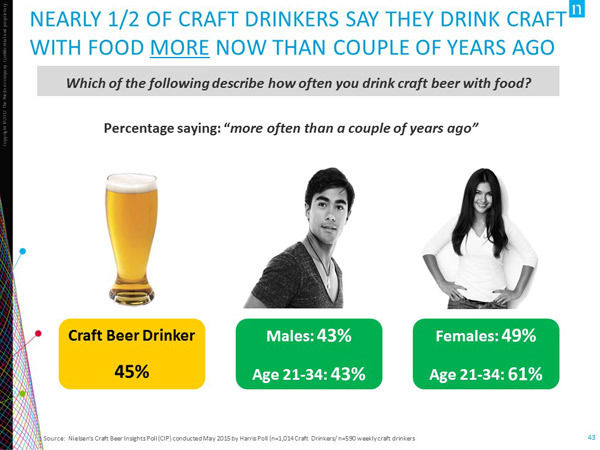 Additionally, 90 percent of people surveyed indicated they sometimes drink craft beer with food—with 60 percent likely to pick a specific beer style in that occasion. When it comes to pairing beverages with food, it’s time for the past to be the past. The availability of agricultural ingredients, whether it was barley, hops, grapes or potatoes, once dictated which beverages were popular in certain areas. But today, with standardized refrigeration and speedy shipping, restaurants have a world of brands and beverages to choose from. 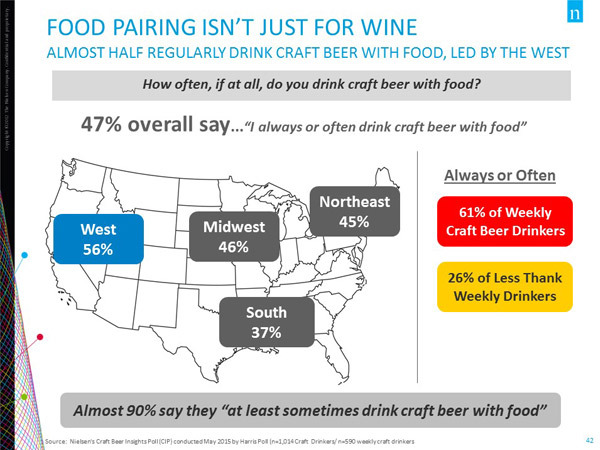 In the U.S. today, beer is more popular than wine. We are a beer-loving nation first and foremost, with $101.5 billion in annual beer sales ($19.6 billion from small and independent U.S. craft brewers). Even combined, the sales of wine ($37.5 billion) and spirits ($69 billion estimated) barely surpass the sales of beer! 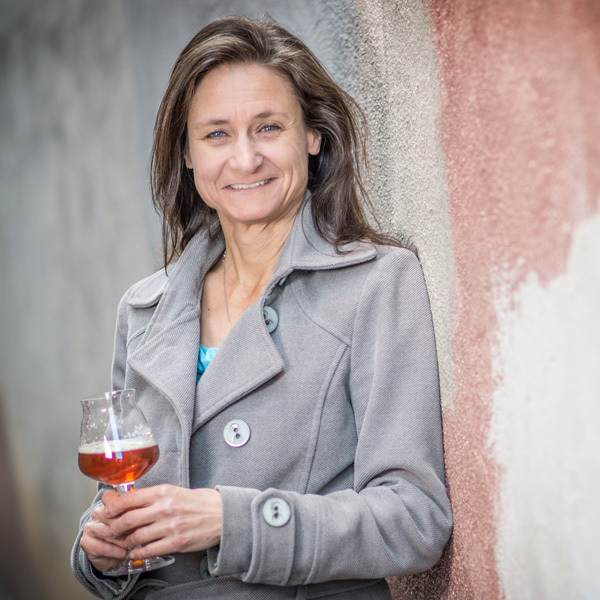 The best way to get traditional foodies pairing with beer is to arm them with information. The bottom line: Beer picks up where wine leaves off. Wine is famous for pairing because of its tannins and acidity. These characteristics balance salt and fats (like animal fat, oil and milk fat), allowing other flavors to shine brighter. Wine also has some flavor harmony with some of today’s foods. However, put beer on the table and it goes where no fermented grape has gone before. Depending on the style, beer also has varying acidity and tannins from both malt and hops (and even wood, when used). It has unsurpassed flavor harmony potential with grilled, roasted and smoked proteins thanks to the flavors of kilned and roasted malt. It has additional flavor echoes from hops’ floral, herbal and citrus notes. Beer’s bitterness, from hops and roasted malt, counters both sugar and fat. Its yeast character’s fruity esters and personality-filled phenols find further flavor connections to food. Beer’s residual sugar pairs and plays well with hot-and-spicy foods. And carbonation scrubs the tongue, getting it ready for the next bite. These reasons alone should be enough to get the food world clamoring for beer’s pairing potential with the same abandon of a chef on the hunt for the first signs of spring at the farmers market. And to complement our revolution’s rallying call, let’s also collectively ask: Dear Restaurateur: Please insist that all of your staff are equally knowledgeable in all beverages, including beer. Doing so will reap rewards. Between the clamor of customers, the stellar sales figures, and the palate-pleasing potential, we have a perfect “one-two-three punch” to convince on-premise establishments to join our craft beer pairing revolution. Beer deserves a leading role on restaurant menus. Let’s hammer that message home, and collectively help kick tradition to the curb. 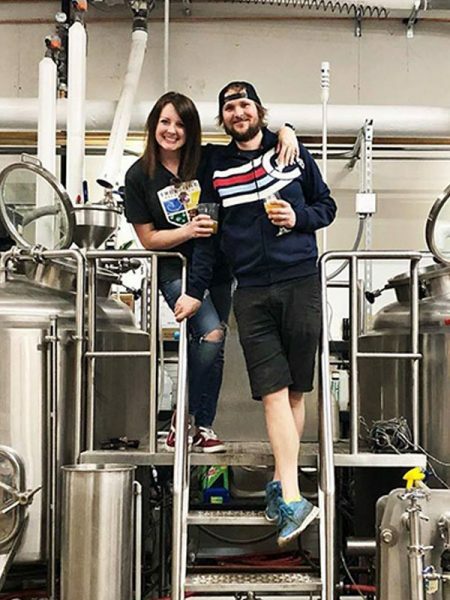 The bottom line is that there is power in pairing with beer, and retailers who adopt this idea will reap the rewards and have happy customers. It’s a win-win-win.